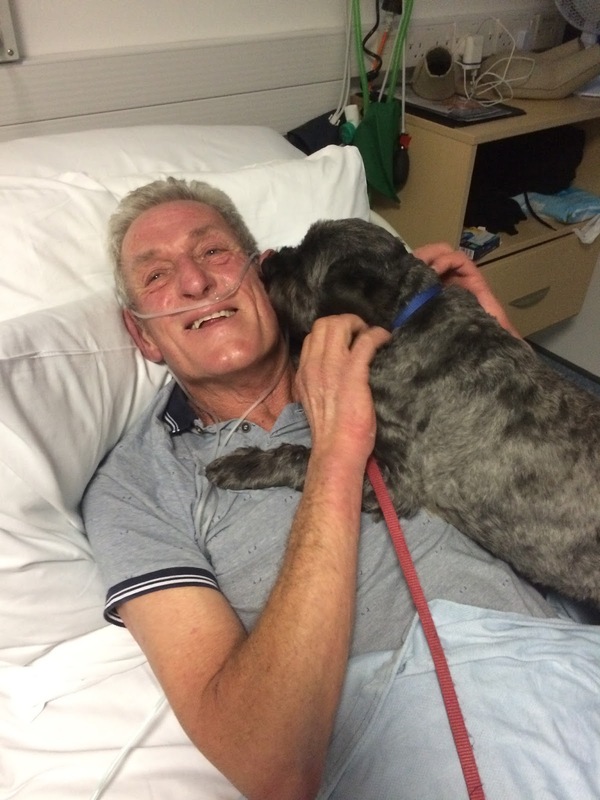 A little RSPCA rescue dog who had such a close bond with his adopter that he helped wake him from a coma has qualified as a Pets As Therapy dog so he can help more people! Five-year-old Teddy amazed staff at Southampton General Hospital when he woke his owner Andy Szasz from a medically-induced coma in December 2016. Civil engineer Andy, from Southampton, had been admitted to intensive care with pneumonia having overcome bowel cancer. He was placed into a medically induced coma and wife, Estelle, sought special permission from the staff to allow her to bring in his beloved pet for a visit. She believes his barking encouraged Andy to wake three days earlier than expected. Andy and Teddy, a schnauzer-poodle cross adopted from the RSPCA’s Stubbington Ark shelter in Hampshire, had such a strong bond that once Andy woke, the little dog continued to help speed up his owner’s recovery by making regular visits and even video calls! Andy said: “Ted is such a remarkable little dog in many ways. He’s clever, loving, loyal, funny and a right little character! He really stole my heart when we first met. The incredible story saw terrific Teddy scoop the RSPCA’s special animal award at the charity’s Honours in 2017. And now, Teddy will be able to help other patients at the hospital that saved his owner’s life – as he’s enrolled as an official therapy dog with the charity Pets As Therapy (PAT). PAT provides a visit service to hospitals, hospices, care homes and schools across the country. “It was amazing to see the smiles on so many peoples’ faces. Not only the patients, but the nurses, the doctors and visitors alike. “Ted was in his element, his little tail non-stop wagging and was unphased by anything, as usual! It was such a rewarding day for us both, and so amazing to see the affect animals have on people. “I’m so proud of my little boy. It was my wish to make Ted a PAT dog to repay the wonderful work the charity does in cheering up patients and the fantastic hospital staff. And Teddy just loves all the cuddles he gets!